NAPLES, Fla. -- Yes, it's a tad weird that every November the PGA Tour visits Tiburon Golf Club's Gold Course and not the Black. You'd think they'd want the pros playing the more difficult of the club's two 18-hole golf courses. 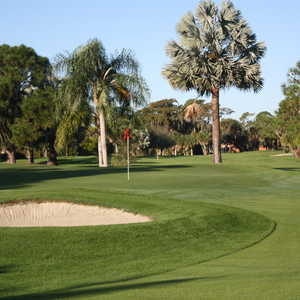 Tiburon Golf Club's Gold Course hosts the PGA Tour and the majority of resort players. But these siblings at the Ritz-Carlton Golf Resort in prosperous Naples (not to be confused with the Ritz-Carlton's beach property a short drive away) share some traits. They both wear the Ritz-Carlton badge well, with immaculate conditioning, attentive service and beautifully groomed fairways, greens and grounds. They share a huge, luxurious clubhouse you could spend most of the day in. 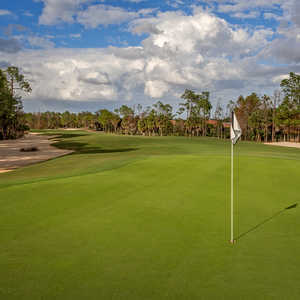 Both are Greg Norman designs, and they show a British influence, with stacked-sod wall bunkers and fast, firm fairways. The grass is cut short at both courses, and you can putt from well off the green. Both Black and Gold sport coquina shell bunkers, which are designated as waste areas, enabling you to ground your club without penalty. They aren't as penalizing as sand bunkers, once you get used to them, because the crushed shell acts almost as hardpan. Once you've learned to pick the ball clean, they become less fearful. Finally, neither course has rough. That sounds good on the surface: It seriously curtails the number of lost balls and eliminates nasty lies out of foot-high grass. But it isn't all good: With no rough, there is nothing to slow wayward shots, and your ball can scoot well off the fairway. That counts for a bit more on the Black Course, which, though shorter than the gold, is narrower and more intense. "The Black is more of a shot-maker's course," said Phil Werz, communications manager at the Ritz. It's also more of a pure golf experience, with far fewer homes and condos around it than the Gold. "I love it," said David Reed, playing with his wife, Colleen. "I love nature and this is so different than what we're used to. And it's hard for a resort course." The Gold is indeed more like a typical resort course - wider off the tee, with a slope rating of 129 compared to the Black's 138. It's easier to score on, if you can get past the first five holes relatively unscathed. Both the Gold and the Black are good resort courses, scrupulously maintained with the kind of service the Ritz is known for. The two tracks alternate daily between members and Ritz guests, but the Gold remains the more popular. "Most people like to play on the same course where the pros play the Shootout," Werz said. 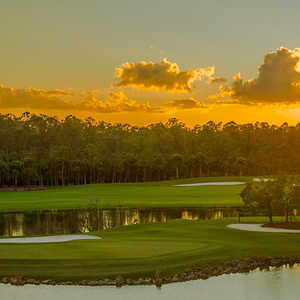 The Ritz-Carlton name has long been synonymous with luxury and its Naples golf resort lives up the image. A little less formal than in years past, it remains a beautiful resort, from palm-lined entrance to the blue crystal and cut flowers inside. The pool area has personal cabanas have their own refrigerators and TVs. You're so pampered here you feel guilty.